The song was the brainchild of Loose Records owner Andy Titcombe. 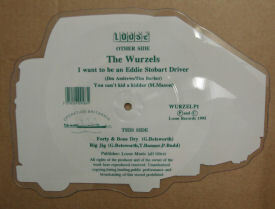 The EP was an entry in the lower reaches of the UK Top 100 and helped re-launch The Wurzels career in the late 90s through to the new millennium. 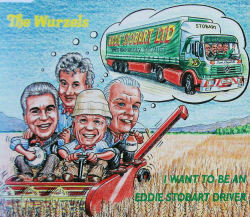 Although it seemed a move away from their agricultural songs, Eddie Stobart also started out in a farming community years ago. 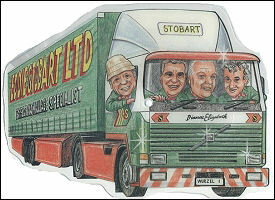 And Eddie Stobart is probably older (as a firm and as an individual) than The Wurzels! Band line-up: Tommy Banner (accordion, keyboard, harmony vocals), Geoff Betsworth (acoustic guitar, dobro, steel guitar and harmony vocals), Pete Budd (banjo and lead vocals) and Malcolm Mason (guitar, sequences and harmony vocals). 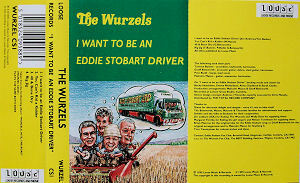 Becky Hutchison, Emma Richardson, Anna Chaddock and Sarah Clarke - backing vocals and cheers on I Want To Be An Eddie Stobart Driver. Production Arrangements: Malcolm Mason and Geoff Betsworth. Recorded at Lemon Grass Studio in Cumbria. 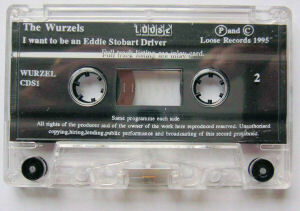 Although the sleeve of the cassette claims that the tracks were taken "from the forthcoming albums Wurzels, Hits, The Roads" - this album was never recorded. Other songs written for the album were never released. The EP is still available on CD and is now also available as a Download through the Internet Record Store CD Baby. 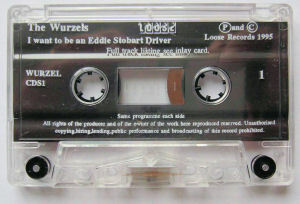 Loose Records are also slowly clearing out the last of the cassette versions of the release through eBay.co.uk. 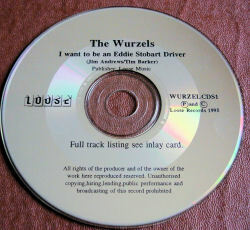 You will also find the lyrics to I Want To Be An Eddie Stobart Driver on the CD Baby website.